Other Names: Achiote, Annatto, Achote, Urucu, Beni-No-Ki, Bija, Onoto. Achiote (Annatto) is a nonedible fruit from the Amazon forest in Peru, South America. The seeds are used as a dye. These fruits have been found in old civilizations in Peru - such as the ancient cities of Caral and Casma - dating as far back as 5000 years ago. The natives used to mix lime and coca as a powerful inhalant psychedelic and intoxicant. Having grown in popularity, today achiote trees are cultivated throughout tropical and subtropical regions of the world, including Central America, Africa and Asia. Traditionally, Achiote is commonly found in Latin America and Caribbean cuisines and widely used both for favor and color. Many Latin American cuisines use Achiote in recipes of Spanish origin that call for saffron. Achiote is used in arroz con pollo, to give the rice a yellow color. In Venezuela, Achiote (called locally Onoto) is used in the preparation of Hallacas, Perico, and other traditional dishes. 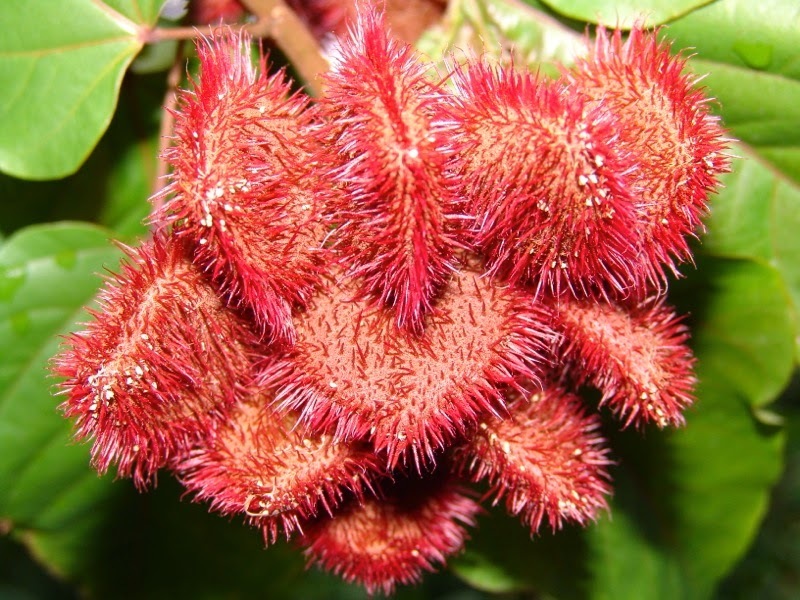 In Brazil, both Achiote (the spice) and the tree itself are called Urucum, and the spice may also be called Colorau. In the Caribbean, both fruit and tree are popularly called achiote or bija. Achiote (Annatto) may be better known to Mexican and Latin markets as Achiote or in the Philippines as Atsuwete or Achuete. In the West it used to color confectionery, butter, smoked fish and cheeses like Cheddar, Cheshire, Leicester, Edam and Muenster. Achiote dye is also used to colour hair-oils, shoe polishes, floor polishes, nail-gloss, furniture, brass-lacquer, soap, cosmetics and pharmaceutical ointments as well as textiles, wool, leather and calico. In fall, the achiote fruit ripens and falls right off of the tree. The fruit itself is not edible. But the seeds inside are. The edible pulp around the seeds tastes similar to fresh pepper with a hint of nutmeg sweetness. It is commonly dried, ground and infused into oil to make a concoction called annatto. 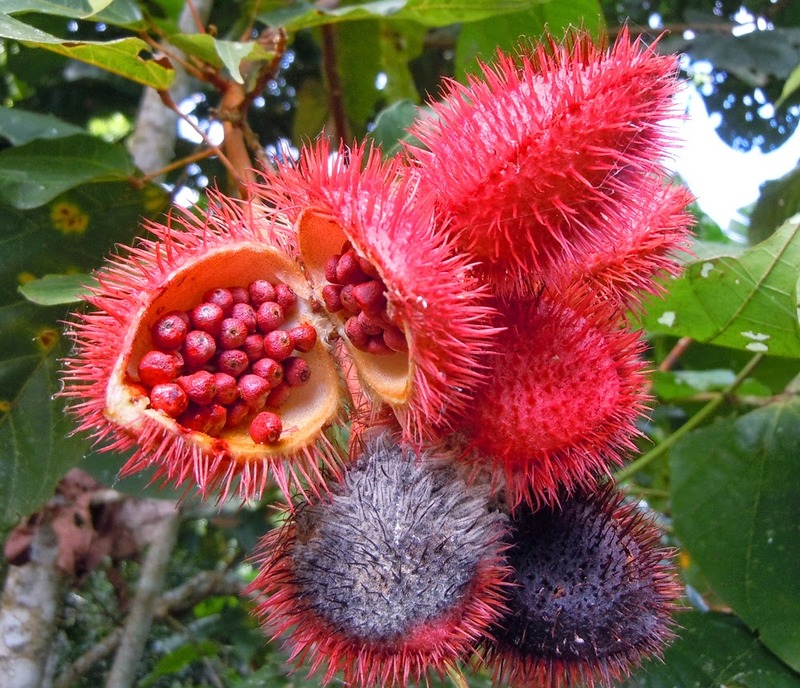 Annatto is frequently added to dishes to punch up the flavor in West Indian and Latin American cuisine. Although you may not have tasted achiote's spicy flavor, you've probably eaten it before. Achiote's widest commercial use is as a natural food coloring made from the seed's coating. Many orange or yellow manufactured foods are colored with achiote. Natural and processed cheeses, butter and margarine, cakes, cookies, snacks and cereals are all commonly colored with achiote. Foods colored with achiote seed are labeled "colored with annatto". Achiote (Annatto)'s bright yellow color is due to its high bixin levels. Bixins are powerful carotenoids like the kind found in carrots. Most annatto is 70 to 80 percent bixin by weight. The brighter the annatto mixture, the higher the bixin content. The native tribes in the South American countries where achiote grows were the first to discover achiote's medicinal properties. While the seeds have the most important culinary use, achiote leaves were the first part of the tree used as an herb. The leaves have a number of medicinal properties that heal external as well as internal ailments. Achiote (Annatto) leaves have anti-inflammatory properties. When a decoction is made from achiote leaves and alcohol and applied topically to the skin, it soothes a number of skin disorders, infections and damage including rashes, burns, cuts and other ailments. The decoction can also be used as a vaginal douche to cure vaginal infections. When ingested, achiote leaves provide even more benefits. Achiote leaves are one of the richest sources of tocotrienols currently known. Tocotrienols are important because they limit the liver's ability to produce LDL cholesterol. That's the kind of cholesterol that clogs arteries and causes heart attacks. The leaves' astringent or anti-inflammatory properties also make it a potent digestive aid. A tea steeped from the leaves of the achiote tree help to stop diarrhea and alleviate the symptoms of dysentery. Three daily cups of tea also improve general digestive problems or discomfort. The more scientists investigate achiote leaves, the more benefits they find. Recent studies reveal that all parts of the achiote plant have hypoglycemic properties. A daily ingested dose of a tea made out of the achiote's leaves or roots reduce blood glucose levels and prevent spikes in blood glucose after a meal. In fact, medical studies of the powerful healing properties of achiote are just beginning. So far, the anecdotal evidence suggests that achiote may have certain properties that fight prostate cancer. For centuries, shamanic healers in South America have used a tea made from achiote leaves to make a strong tea consumed three times daily. Western medicine is just beginning to discover the power of achiote. 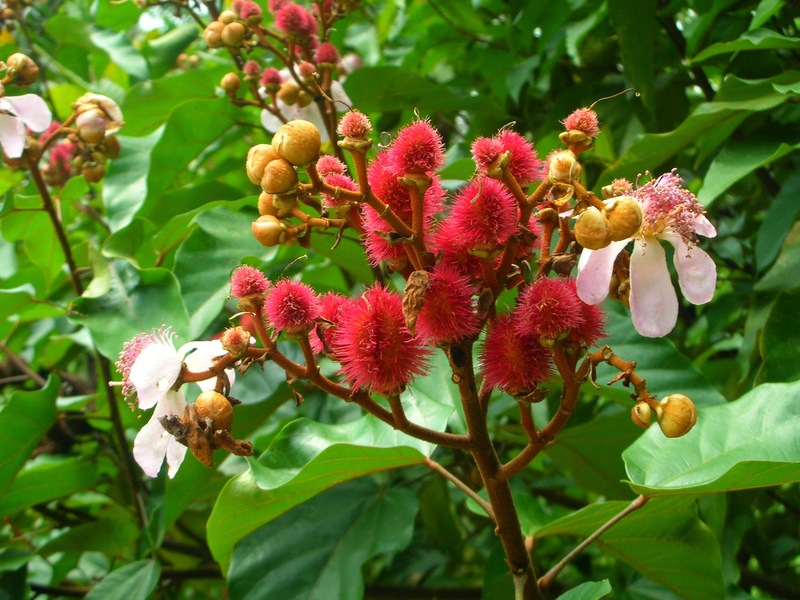 Anecdotal evidence suggests that the different parts of the achiote tree can improve heart health, heal reproductive problems, eliminate systemic infections and more. Achiote (Annatto) coloring is produced from the pulp which surrounds the seed of the achiote. Achiote dye is prepared by grinding seeds or simmering the seeds in water or oil. Because it is a natural colorant, companies using annatto may label their products "all natural" or "no artificial colors" but, "Natural" does not, of course, mean safe or non-toxic, it has been linked to some cases of food-related allergies. Achiote (Annatto) is finding popularity in the modern kitchen as a natural alternative to synthetic food coloring compounds. Its unique flavor helps to capture the nuance of regional cuisines and add authenticity to Latin American, Caribbean, and Mexican fare. Achiote (Annatto) is safe for most people when used in food amounts. It is not known if Annatto is safe for use as a medicine. It should not be used during pregnant or breast-feeding, or scheduled for surgery in two weeks. The appropriate dose of Annatto depends on several factors such as the user’s age, health, and several other conditions. At the time there is not enough scientific information to determine an appropriate range of doses for Annatto. Always should remember that natural products are not always necessarily safe and dosages can be important. Be sure to follow relevant directions on product labels and consult your pharmacist or physician or other healthcare professional before using. 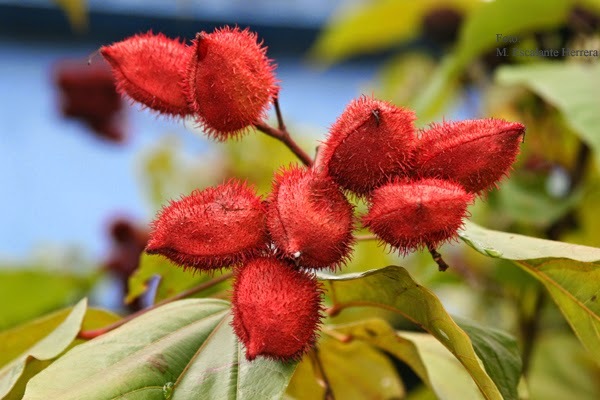 Annatto has discovered from ancient of years and has been used since centuries. It is used in many purposes as for food coloring, dyes and also for medical care. It’s leaves and fruits both are used for internal and external benefits. Leaves of Annatto are used for medical need whereas fruits are used for health purpose. It should be consumed according to the needed. It should not be overdose used. The benefits it provides by using in according manner might also cause to disaster by taking it in overdose. Many of the people had done research on this plant to know more uses occurred by this the heart-shaped fruit. In respect of unexplained effect to carbohydrate metabolism not recommended by diabetics. Always check with your healthcare provider before using any natural or homeopathic substance of pharmaceutical.